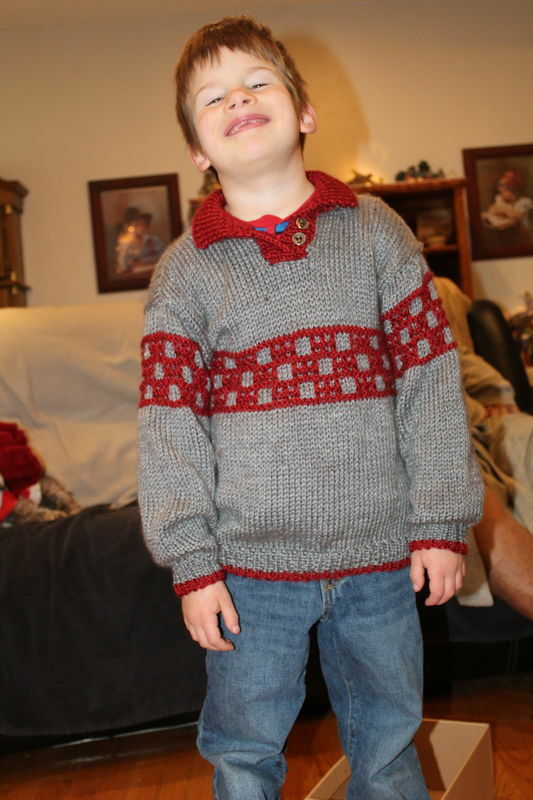 My grandson picked this sweater out in Mary Maxim, I ordered it and made it and it is his new favorite sweater. The buttons on the sweater were given by his great grandmother, whom he has a very special bond with. Handsome young man! Wonderful sweater. You do lovely work. Very nice sweater and you did a lovely job on it. Wow, doesn't he look proud and you must be proud too of your beautiful work. Its great that he bonds with you and his grandma. What a good looking young man and a wonderful sweater, no wonder he is looking so pleased. He looks so happy in his great, new sweater! What a smile!! He is a good-looking young man! And his sweater is really nice! I like the checker-board effect! Great sweater on him. His smile tells it all. Gosh ~ that is so handsome and fits him well. I love the colors. Handsome young man, I love the sweater, is gorgeous. Handsome young man, the sweater is gorgeous.